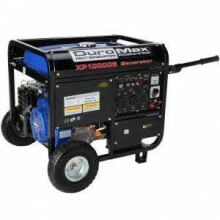 Click the button below to add the Duromax 10,000-Watt 16.0 Hp Gasoline Powered Electric Start Generator with Wheel Kit and CARB Compliant to your wish list. Let's face the facts; all you have to do is listening to the news today to recognize that natural disasters and infrastructure failures have become part of our everyday life. No one wants to be at the mercy of depending on public utilities in times of crisis. Why place your family at risk when you can have the protection and security of a DuroMax generator. The XP10000E-CA is the powerhouse you can depend on for emergencies, insuring your essential appliances are running smoothly, reliably and without interruption. It also provides the added power to run demanding high amperage tools and appliances that other generators in its class cannot provide. The DuroMax XP10000E-CA is not only the essential generator to safeguard your family, but can provide you power when needed for work and play as well. This rugged workhorse is ideal for the jobsite where powering saws, drills, and other equipment is critical. Extra large 10-1/2" Never Flat Knobby Style Solid Fill Tires.